Angels Flight Railway – A Los Angeles Landmark Since 1901! The Railway is open daily, seven days a week, 365 days a year, including holidays, from 6:45 in the morning until 10:00 at night. 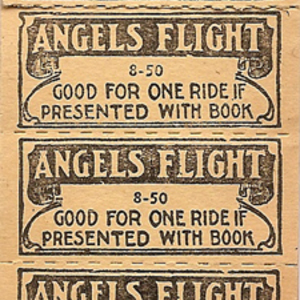 The fare is $1.00 each way, and you may purchase a souvenir round-trip ticket for $2.00 to take a piece of history home with you. A $0.50 Metro fare discount is available for TAP Card users with Stored Value — for a one way trip. You will need to tap your valid TAP Card on the Validator located at the Angels Flight Station House ticket window to be granted the discount. TAP cardholders must load Stored Value to ride. Five-ride and 40-ride discount commuter ticket books, good for one person only and for thirty days, are also available for purchase. The Railway’s Top Station is located at California Plaza, 350 South Grand Avenue, Los Angeles 90071. The Lower Station is located at 351 South Hill Street, Los Angeles 90013, across from Grand Central Market. The 117-year-old funicular takes passengers on a short ride between Hill Street and Grand Avenue on Bunker Hill. 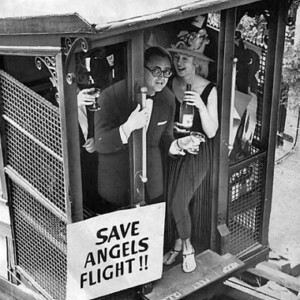 Originally opened in 1901, Angels Flight® — the world’s shortest railway — has given more than 100 million rides along its hillside track. 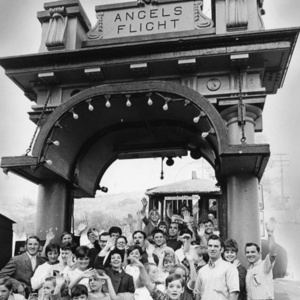 In 2017, the Angels Flight® Railway Foundation selected the Angels Flight® Development Company, LLC, a joint venture led by ACS Group, to recondition, operate, and maintain the funicular for the next 30 years. Passenger service operations, subject to occasional closures for maintenance, recommenced on August 31, 2017. In 1901, Bunker Hill was one of the most fashionable neighborhoods in Los Angeles, and the cars, Olivet and Sinai, ferried riders up and down the steep slope between Hill and Olive Streets, adjoining the Third Street Tunnel. The beloved landmark was dismantled for “urban renewal” of the area in 1969. In the early 1990s, the Railway was refurbished and relocated a half-block south from its original location, reopening adjacent to California Plaza in 1996. As short as it is (298 feet), Angels Flight® is an essential Los Angeles experience. Explorable 3-D scan of Angels Flight Railway by Craig Sauer.